Shared approach to achieving it. A priori justification and guidance for work. Empowering staff to take action. The terminology used was much less consistent. For example, a mission might be simply a statement of objectives or might also include ways to get there. Some approaches distinguish principles and values as being objective or subjective, respectively. Values are variously asserted as supporting company goals, culture and philosophy, to guide decision-making, or to establish standards. After talking around the differences for a while we agreed to use the term "values" as a catch-all to begin with. Semantics can be crucial — as you'll discover if and when you attempt to get a group of people to agree to a list of values — but the semantics of naming the way the values are presented seemed less crucial than the values themselves. We waited to see whether some way of capturing our values naturally fell out of our conversations. What do we want to achieve with it? How will we go about achieving it? We started with the Why in a lightly-facilitated discussion where I used a mind map on the whiteboard to capture our suggestions, questions, and criticisms without filtering. I aimed to apply minimal interventions to the conversation while giving everyone opportunities to share their perspective. I wanted to clarify points, to amplify shared understanding, and to get some agreement that I was recording the correct intent of all contributions. Focusing on the right work. Explaining what work we do. We also thought of some things that we'd consider to be negative motivations for team values. These included making them as some kind of marketing exercise or as a way to measure success. We clarified to ourselves that dropping an idea was no comment on its merits in context, merely that we were choosing to pursue a different line at that time. Likewise, we were at pains to point out that by nominating some particular set of values for our team we wouldn't be saying that these were our only values. That seemed like a good start. 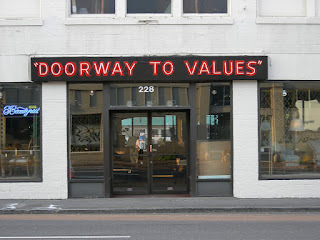 With a set of potential reasons for having values we began to consider what kinds of values could support them. That'll be the next post.